Here are some snazzy birthday facts about 23rd of May 1981 that no one tells you about. Don’t wait a minute longer and jump in using the content links below. Average read time of 10 minutes. Enjoy! What day was my birthday May 23, 1981? May 23, 1981 was a Saturday and it was the 143rd day of the year 1981. It was the 21st Saturday of that year. The next time you can reuse your old 1981 calendar will be in 2026. Both calendars will be exactly the same! This is assuming you are not interested in the dates for Easter and other irregular holidays that are based on a lunisolar calendar. 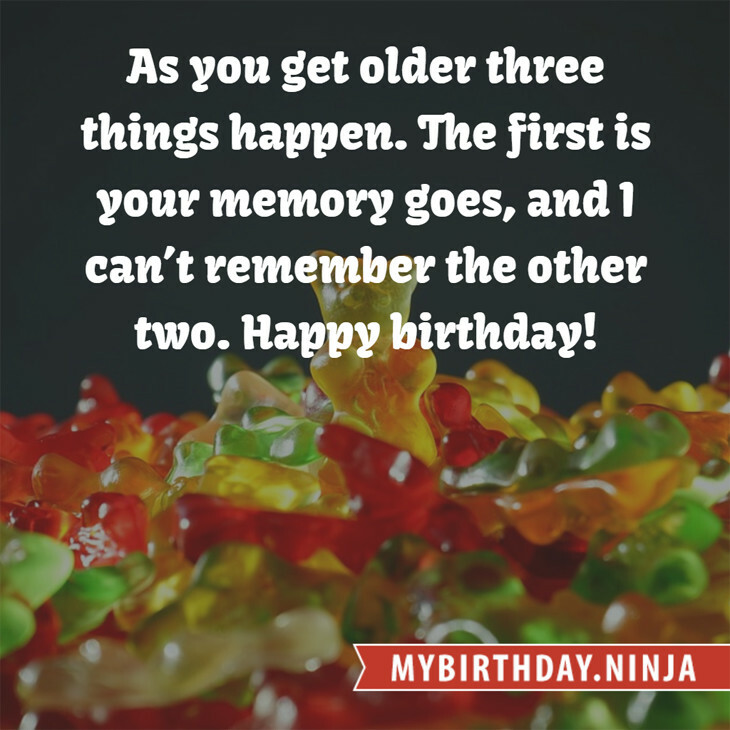 There are 33 days left before your next birthday. You will be 38 years old when that day comes. There have been 13,846 days from the day you were born up to today. If you’ve been sleeping 8 hours daily since birth, then you have slept a total of 4,615 days or 12.64 years. You spent 33% of your life sleeping. Since night and day always follow each other, there were precisely 469 full moons after you were born up to this day. How many of them did you see? The next full moon that you can see will be on May 18 at 21:13:00 GMT – Saturday. Fun stat: Your first one billion seconds (1,000,000,000) happened sometime on January 29, 2013. If a dog named Zelmo - a Border Collie breed, was born on the same date as you then it will be 186 dog years old today. A dog’s first human year is equal to 15 dog years. Dogs age differently depending on breed and size. When you reach the age of 6 Zelmo will be 42 dog years old. From that point forward a medium-sized dog like Zelmo will age 4.5 dog years for every human year. The marriage of King Henry VIII to Catherine of Aragon is declared null and void. Dutch rebels led by Louis of Nassau, defeat Jean de Ligne, Duke of Arenberg, and his loyalist troops in the Battle of Heiligerlee, opening the Eighty Years’ War. The Second Defenestration of Prague precipitates the Thirty Years’ War. Battle of Ramillies: John Churchill, 1st Duke of Marlborough, defeats a French army under Marshal François de Neufville, duc de Villeroy. The New York Public Library is dedicated. World War I: Italy joins the Allies after they declare war on Austria-Hungary. The American bank robbers Bonnie and Clyde are ambushed by police and killed in Bienville Parish, Louisiana. The Federal Republic of Germany is established and the Basic Law for the Federal Republic of Germany is proclaimed. Robert Stephenson’s pioneering Britannia Tubular Bridge over the Menai Strait is catastrophically damaged by fire after standing for 120 years. What does my birthday May 23, 1981 mean? Your birthday numbers 5, 23, and 1981 reveal that your Life Path number is 11. It is a master number that represents intuition, idealism and invention. You have the potential to be a source of inspiration and illumination for people. The following celebrities also have the same life path number: Ian Nelson, Tyler, The Creator, Georges Ulmer, Nathan Lopez, Kim Sa-rang, Ted Raimi, Jörn-Uwe Fahrenkrog-Petersen, Joe Cornish, John Mackenzie, Dhanush. 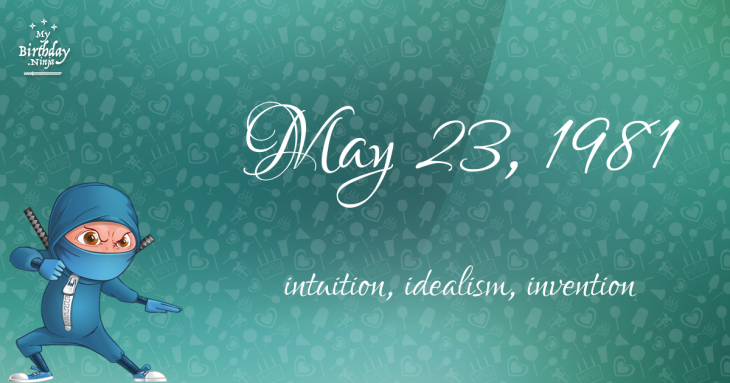 What is the birthday horoscope for May 23, 1981? The Western zodiac or sun sign of a person born on May 23 is Gemini ♊ (The Twins) – a mutable sign with Air as Western element. The ruling planet is Mercury – the planet of communication. According to the ancient art of Chinese astrology (or Eastern zodiac), Rooster is the mythical animal and Metal is the Eastern element of a person born on May 23, 1981. Fun fact: The birth flower for 23rd May 1981 is Lily of the Valley for purity. What is the Love Match for May 23, 1981? When it comes to love and relationship, you are most compatible with a person born on January 21, 1954. You have a Love Match compatibility score of +128. Imagine being in love with your soul mate. On the negative side, you are most incompatible with a person born on May 31, 1988. Your incompatibility score is -122. You’ll be like a cat and a dog on a love-hate relationship. Arf-arf, I want to bite you. Meow-meow, stay away from me! The number-one hit song in the U.S. at the day of your birth was Bette Davis Eyes by Kim Carnes as compiled by Billboard Hot 100 (May 23, 1981). Ask your parents if they know this popular song. How many babies were born on May 23, 1981? Base on the data published by the United Nations Population Division, an estimated 127,030,934 babies were born throughout the world in the year 1981. The estimated number of babies born on 23rd May 1981 is 348,030. That’s equivalent to 242 babies every minute. Try to imagine if all of them are crying at the same time. What is the popular baby name on 23 May 1981? Here’s a quick list of all the fun birthday facts about May 23, 1981. Celebrities, famous birthdays, historical events, and past life were excluded. Try another birth date of someone you know or try the birthday of these celebrities: November 19, 1976 – Robin Dunne, Canadian actor, producer, and screenwriter; October 16, 1925 – Angela Lansbury, English-American actress, singer, and producer; December 23, 1929 – Ike Jones, American actor and producer (d. 2014).